ANDY NIKKI TY HALEY: What we've been up to. Ty and Haley are growing up so fast! I can't believe Haley is already 3 months old. Does anyone still blog these days? 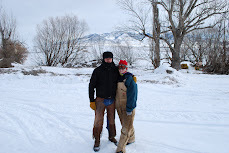 Our Trip Last Weekend- We went snowmobiling with some friends in Daniels, Idaho. It was a blast... we missed our helmets though. Our cheeks were freezin!